In the past ten years, the Department of Justice has brought more than 150 cases against large corporations under the Foreign Corrupt Practices Act (FCPA), collecting billions of dollars in fines. What impact is that body of work having on deterring foreign bribery? In part because the fines against the corporations are not big enough to deter corporate bribery. In part because the fines are not used to heal the injuries caused in countries where the bribes were paid. And in part because executives of major multinationals are not going to jail for the bribery committed in the name of their corporations. 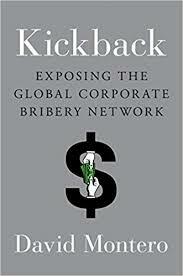 In his new book, Kickback: Exposing the Global Corporate Bribery Network (Viking, 2018), David Montero takes a deep dive into foreign bribery and the U.S. government’s anemic response. Montero cites the work of University of Washington Finance Professor Jonathan Karpoff. Karpoff estimates that more than 1,567 corporations have paid bribes, but only 100 have been charged. Karpoff also finds that corporations charged with bribery faces little reputational risk. Karpoff says that to deter bribery, the chance of getting caught times the amount times the amount you pay if you get caught has be at least as large as the benefits. Right now, the fines for bribery amount to something like one percent of market capitalization. Karpoff says that to deter bribery, that’s going to have to go up to something like 40 percent of market capitalization. “How is that possibly going to result in deterrence? If we want these fines to be effective, they have to be much higher, so much more meaningful than what they are now. They are now just another cost of doing business. Is it politically possible to hit these companies with these fines that are forty percent of market cap? What are the social harms that bribery inflicts? In the book, you talk about Gulf Oil and Korea. Almost all of the others you spoke with — Lanny Breuer, Peter Clark – they swung through the revolving door. And maybe if they didn’t see the gold at the end of the rainbow, they would follow Karpoff’s dictate to heavily fine the corporations. Or Pelletier’s that — put the responsible corporate executives in jail. In your book, you have a section on China. Do multinational corporations still have to pay bribes to do business in China? There is a bribery scandal in Canada where SNC-Lavalin paid bribes in Libya. The company starts a lobbying campaign to get a deferred prosecution in Canada. The Attorney General says no, but they keep lobbying. And now there is a scandal threatening the Liberal Party government.